Panache, elegance, high-voltage partying, and the illustrious New York City social scene: Bryant Park Grill near Times Square is offering it all up this New Year’s Eve. The sophisticated and highly celebrated NYC restaurant-lounge is set to the sumptuous landscape of the lush Bryant Park and this New Year, you can reap the beauty of the park and the venue’s famously haut monde guests to give the New Year a dazzling welcome. Say “Bonne Annee!” the New Year at the chic and fabulous Bryant Park Grill, located a stone’s throw away from NYC’s Times Square this New Year’s Eve. Kick off the night in style sipping on spirited cocktails at the 6 and half hour premium open bar. Jive or cavort into the New Year with a heart-pulsing mix of Top 40s, Dance, Hip Hop, and House beats played by one of the hottest DJs in NYC. At this exclusive NYE bash, you’ll be treated like the deluxe guest that you are with complimentary early evening butlered hors d’oeuvres and deliriously fun holiday party favors to raise the spirits high. Usher in the New Year with an electrifying countdown led by the exclusive Bryant Park DJ and dedicate your complimentary champagne toast to a New Year as unforgettable as this NYE night. Lusting after more luxurious treats? Bryant Park Grill offers splendid Patio and Rooftop VIP packages for groups and couples, helping you make the night even more exhilarating. Bryant Park Grill, NYC’s acclaimed restaurant and lounge, has the elegant setting and haute-style crowd for a brilliant NYE celebration. Just a block away from the Times Square Ball Drop, Bryant Park Grill is an oasis of natural charm with an air of class and grandeur. Featuring the impeccably lavish greenery and promenade of the world-renown Bryant Park, Bryant Park Grill highlights the essence of the park outside with a simple interior and a soaring glass atrium beholding the expansive sky. Celebrities like Gwen Stefani, Gavin Rossdale, P. Diddy, Carrie Underwood, Carmen Electra and Anne Hathaway have frequented the popular resto-lounge where you can bask in the upscale and posh ambiance favored by NYC moguls, fashionistas and trendsetters. No wonder the fashion and social high-fliers of the illustrious Mercedes Benz Fashion Week congregate at Bryant Park Grill twice a year: it’s a coveted and beautiful scene of elegant interior and even more elegant guests. 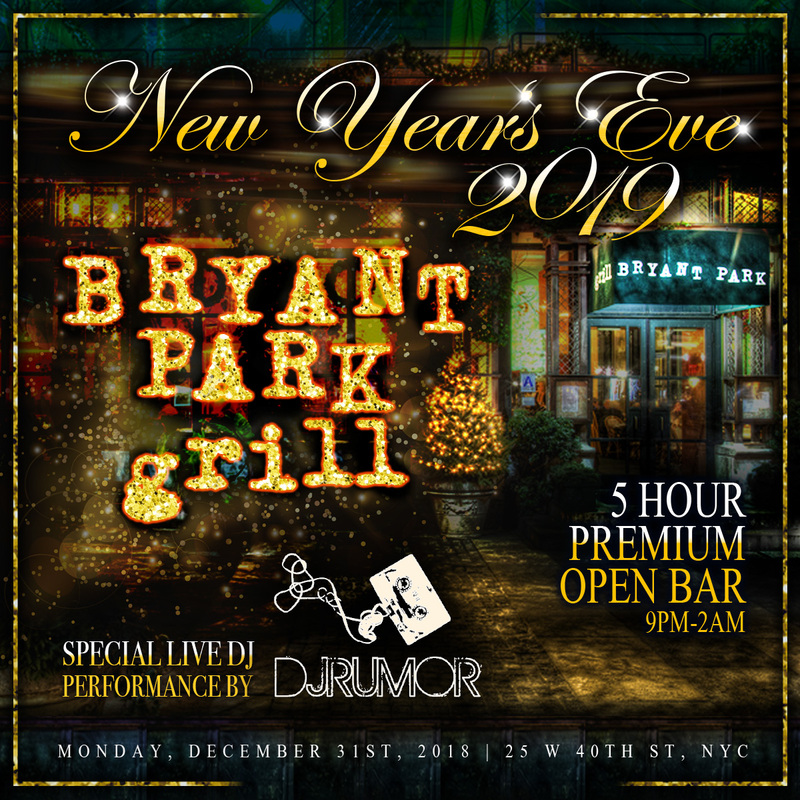 A block away from New York City’s popular Fifth Avenue, overlooked by the magnificent New York Public Library, Bryant Park Grill is sets the stage for the most perfect New Year’s evening. Be at the center of the universe - or at least NYC’s premier NYE celebration - this New Year’s Eve at the Bryant Park Grill. This favorite of the high-living elite is delivering a chic and explosive NYE bash that will be truly extraordinary.